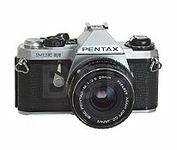 Pentax ME Super - What can I say, I had my Pentax kit stolen some years ago. I missed it terribly but ended up buying a Canon EOS 500 as a replacement because it was a bargain at the time. The other day whilst looking on Ebay, I spotted an ad for a pair of MEs' and miscellaneous bits. Stuck in a bid and picked up the lot for £100! This included two Pentax ME Super's, a large ally case, a Pentax flash, a bunch of Cokins, two 50mm, 80-200mm, 28mm lenses, autowinders...... I've put the digital to one side for now whilst I re-discover the joys of 'good old' slr work. The camera is as tough as old nails, really comfortable and compact. I'm using one without batteries 'cos as its mechanical and if you can live without the shutter info you can still take photographs. Don't forget to manually focus it, no autofocus here. You would never believe these are now 20 years + old! If you want a good, reliable, fun camera which will take brilliant photographs, see if you can pick one of these up! You won't regret it. Extra Meter Comments Center-weighted through-the-lens light metering. +/- 2EV exposure compensation. Extra Comments Operates without batteries at mechanical shutter setting (125x). Split-image/microprism focusing screen.